YFX-2500 Five-Axis CNC Milling Machine is one of the professional tire mold processing machines researched and developed by our company. The main mechanism has been granted a national patent. The machine is provided with four servo axes (three linear axes and one revolving axis ) and one axis for working disc turning ,which could realize. 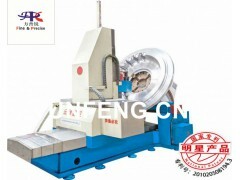 all-dimensional fine processing of tire mold pattern. And, generally there is no need for further EDM processing which reduces the costs significantly and improves production efficiency .It is definitely the first choice for tire mold manufacturers.